Last weekend saw London host the 2015 3D Print Show and as this is something very important to what I am doing I went along to see what new products are coming out and to have good look at the new range of home or desktop 3D printers. As expected with such a show there were all types of stands from manufactures of 3D printers to suppliers of 3D printing parts and services. They even had a 3D printed food bar! In particular I was interested in seeing how the desktop 3D printers had improved since I first started getting in involved. I wanted to know how the quality of the finished prints came out and if they could be used succesfully for my 3D models. I had a close look at the big name manufacturers as well as a lot of the new machinery that is coming from startup companies, several of which have been funded by Kickstarter programs. For the most part the desktop machines all work in the same way with plastic filament being heated and laid down by a print head. The limiting factor with this technology used to be the layer thickness, the thicker the layer the more lines are visible on the print. But now as the manufactures have found ways to reduce this thickness, the size of the print head nozzle is becoming more of issue. If you can imagine a very small detail on a part, the quality that is attainable is dependant on the width of the material coming out of the nozzle. Out of all the ‘traditional’ 3D print machines the Ultimaker 2 printers seemed to have the smallest print head nozzles and were giving a nice product but sadly for any of my 3D models the layering effect was still too intrusive. The next development to the machines that has made a noticeable improvement was a change in the way the motors and drive mechanisms that move the print head worked. Traditionally there is a motor for the X and Y (both horizontal) movements. Each drive a rubber belt which move the print head. The motors are usually very accurate steeping motors which gives the accuracy when moving the print head but there is still ‘wobble’ generated by the movement and the faster the printer is working the more ‘wobble’ you get. The improved machines, as pictured below, still use motors and belts but the system is very different. There are three motors that each move a belt vertically. Attached to each belt is a pair of fixed length rods. The print head sits at the convergence of the three pairs of rods. As each motor adjusts the height of its belt the head moves over the print. If all three motors work together the height is adjusted. This new style of mechanism is clearly smoother than the traditional X and Y system and gave a better finish. However once again the layering effect was still not good enough to be acceptable for my 3D models. There was only one 3D desktop printer that I feel comes close the level of quality required for my 3D models and that was the Form 1 built by Formlabs. This machine is totally different to the others. It has a tray that is filled with a plastic liquid. The build plate is lowered into this tray and a laser fires up through the tray and solidifies the parts that you want to the underside of the build plate. As the machine is working the build plate is raised and the model is pulled out of the liquid. Because this system has far less moving parts to add ‘wobble’ into the finished print, in my opinion, it gives the best finish out of all the desktop printers. And I must say for some of my models it would work well. The one issue all of these printers had in common was the locations of the support material. This is the structure that supports overhanging parts as they can’t be printed in mid-air. These need to be broken off and this always leaves a small mark, similar to an injection mold mark. Both Ultimaker and Formlabs seem to have got this down to a minimum but I could still see on the models they had printed at the show where they needed to be touched up. So the question is would one of these replace the need to get my models printed by Shapeways? The answer is not yet. The other issue is, as the technology for the desktop printers has improved, so has the technology for the commercial printers. You may recall from a few weeks ago I posted about Shapeways new material FXD (Frosted Extreme Detail), you can read the post here. I have now had parts and locomotive shells printed in this new material and I am very impressed. 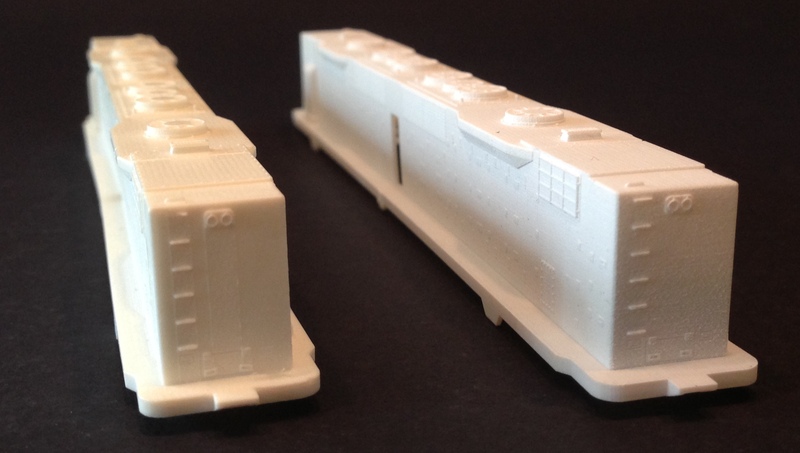 Below is a comparison between two N Scale EMD DD35 shells. The one on the left is printed in FUD (Frosted Ultra Detail) and the right in the new FXD, these pictires were all taken by Mike Musick. Normally I reduce the size of image files for my posts but I have left these as large images so if you click on them you can see the detail. In the photo below you can see the shadow effect under the headlight at the top of the model on the left. This has not happened with the FXD model. This shell has been improved by the FXD print without altering the design model. The print process to make both FUD and FXD prints does not leave any support material marks and because of the high level of detail achievable I don’t think desktop printers are ready just yet to be considered as an alternative. This is particularly true for N Scale models, although as a test printer they do the job well, and for chassis and parts that are not always visible the Form 1 would be perfect. The 3D Print Show also introduced me to some other companies whcih provide services like Shapeways. One is I.Materialise who had an impressive display of printed materials. Their full colour plastics were particularly interesting and I will be looking into what I can do with them later in the year. Another useful 3D print service came from 3DPRINTUK who print in SLS; this is the same as Shapeways’ White Strong & Flexible material and in fact they use the same machines. Their pricing structure is different and for multiple runs of small parts they work out a lot cheaper so I will be making good use of them. Another product that looks like it will be very useful to anybody with a desktop printer, except the Form 1 style, is the 3D printing mat called Zinomat from 3DSVP. This is a mat which prevents your 3D printed item from getting damaged when it is removed from the build plate, as can sometimes happen. This mat is in two parts; the first fixes itself to your build plate, the other is magnetically fixed to the first. Once the print is complete you simply pull up the magnetic mat, then as it is flexible, it allows you to gently roll the print off the mat. There was also a section of the show dedicated to software for running 3D printers. 3DPrinterOS allows you to connect your 3D printer to the Cloud which means you can send prints to it from anywhere in the world. They also offer enhanced slicing tools, model fixing tools and better connectivity to improve the way your 3D printer runs. The 3D Print Show wasvery interesting and highly informative about the current state of home or desktop printers. It has made me consider getting one for home use, although only as a testing device. I will certainly go again next year and maybe by then the technology will have improved so much that I can’t say no. Getting back to my normal 3D printing activities I currently have a few orders being printed by Shapeways and in my next posts I will be sharing them with you. The weekend before last I was invited to visit the Mckinley Railway and in this post I will share with some pictures and video of the layout as well as a description of why this layout has been given the title, ‘Britain’s Most High Tech Model Railway’. The Mckinley railway belongs to David Townend and with the aid of some fellow modeling friends he has built a wonderful model railway that does more than first appears. The railway is a British outline OO Gauge layout set between 1958 and 1972. David has modeled the main line section between London Kings Park Station and Manchester Park Street Station. Along the way the line passes though the stations of Birmingham Broadway and Mckinley Road. When you first walk into the actual layout room you are greeted with the sight of London Kings Park Station. This is a terminus station with six stub end passenger lines, a parcels depot, an engine facility and three coach sidings. Although it is difficult to see, all the lamps in the yard are lit. The locomotive facility has both steam and diesel servicing facilities and a turntable which is located just to the right of the engine house in the photo below. The in and out lines leave the station over a steel bridge with the locomotive servicing area behind. The lines then meet a double track main line which navigates its way through the railway room. Below is a track plan of the layout’s visible sections; if you click on the image it will display bigger. 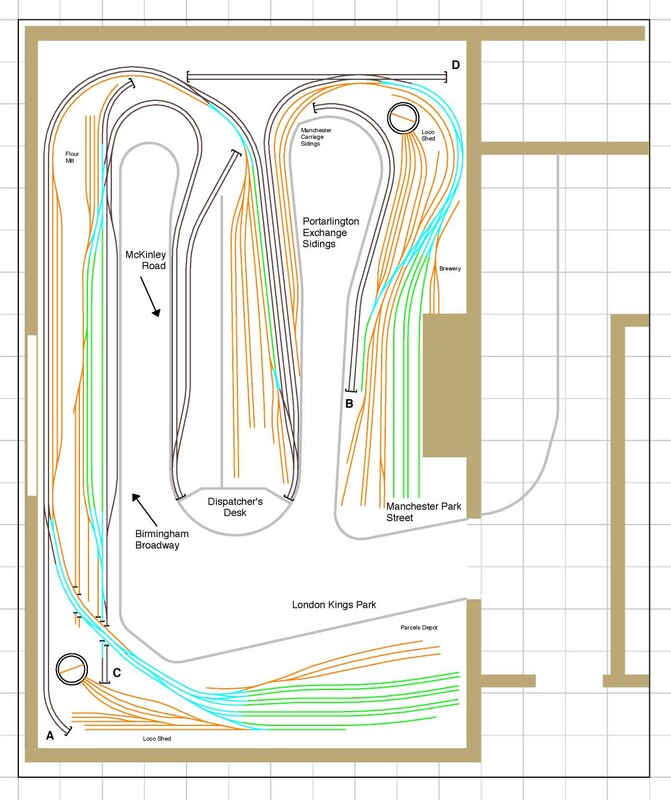 The layout has two double track main line loops folded into the room. The longest is 60m long and the other is 45m. To ensure all this trackage does not make the room over congested there are a lot of hidden track and staging areas which are shown on the plan below. The letters on the plans correspond to the joining sections between the two plans. The other large station is Manchester Park Street and this is also a large terminus station. As with London Kings Park it has stub end platforms, although only four. There is also three carriage sidings, a large engine facility, freight yard and industrial area. Behind the lovely station shown above is a busy scene which has been very nicely modeled and I was allowed to take some pictures inside with the building removed. Because of the larger engine facility and goods yard the throat to the station is complex and the track work is very impressive. All of David’s track has been weathered and looks very realistic. At the back of the engine facility is another turntable. The larger of the two through stations is Birmingham Broadway. The station has four through platforms, a freight yard, flour mill industry and engine facility. This station is situated under the only window in the room and it happened to be a lovely day outside so the light here made it a bit hard for my camera phone to capture the scene in all its glory. The coaches on the high level are in the coach sidings for London Kings Park Station. At each end of the station there is a signal box controlling the train movements, even though the back of the this box faces the operators David has detailed and illuminated the interior. This signal box also controls the access to the engine facility at Birmingham Broadway. The two tracks nearest the signal box are the main line. Another large area on the layout is Portarlington Exchange Sidings. This is a large freight yard alongside both double main lines which converge before passing under the dispatches desk. The final main area is the small station of McKinley Road. This is a small country station on one of the double main lines positioned just after the two diverge. Leaving McKinley Road the double main lines change direction and elevation. 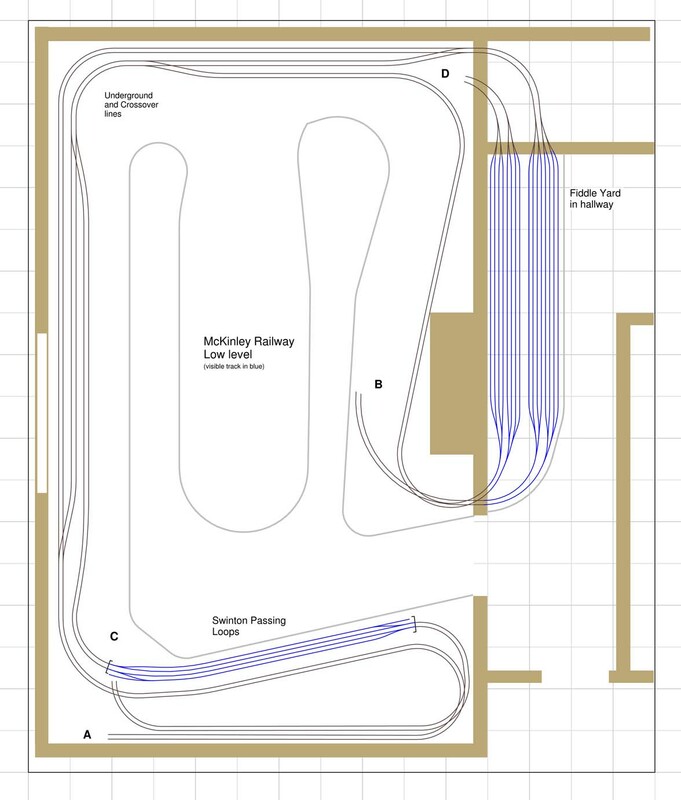 The final part to the layout are the staging areas; as you may have noticed from the track plans above there are several hidden sidings around the layout but the main staging area is in the adjoining room. Each main line has four staging tracks. Now you may be thinking that although this is a very nice layout what gives it the title of ‘Britain’s Most High Tech Model Railway’. Well, firstly, this layout is fully DCC controlled which gives it all the advantages that come with DCC such as sound and lights. Secondly, the layout is computer controlled.David has designed his layout so that it can be operated as a conventional model railway or as a fully functioning busy British main line single-handed. I am sure at some point those of us who have used DCC systems, or DC systems that have more than one controller, have operated two or more trains at once and it was fun untill something went wrong because you were watching one train while the other was busy pushing a 10 coach train into the engine shed! David wanted to create the feeling of this busy railway but with a controllability that ensured things did what they should do. To achieve this the McKinley Railway’s 650m (2000ft) of track has been split into 90 separate blocks all controlled by occupancy detectors from Digitrax. Each block or section has its own signals which are automated either by the occupation of the block in front, or by the computer. The 150 points or turnouts on the layout are all powered by Tortoise point motor machines which are connected to Digirtrax DCC stationary decoders. This whole system is connected together via the Digitrax LocoNet system and linked to a PC. David uses software from Freiwald Software called TrainControler. With this system David was able to map out the railway and tell the computer where each of the block sections are and how long they are, where all the points or turnouts are, what trains are on the layout and where they are. Once the system knows all of this the operator could, say,, run a train from London Kings Park Platform 4 to Manchester Park Road Platform 2 and the system would set all the necessary points and run the train. Then whilst that train was trundling around you could say run a train from Birmingham Platform 4 to Manchester Platform 1 and it would also do it. But as the first train would also be coming up behind the second train on the same tracks, the system works out where and if the trains will meet and will prevent them from colliding. The system also knows what the different trains are and knows the priority of each. So if the train from London was an express and the train from Birmingham was local it would allow the express to pass the local without holding up the express. When you factor in 100+ different trains in the layout the benefit of this really becomes clear. David has pre-programmed several sets of movements into operating sessions, for example, a typical day in 1964 with all the movements between London, Birmingham and Manchester plus the rest of the UK represented by the staging yard. The computer will work though them all in the correct order, moving trains around the layout, stopping local trains at the small station, moving them aside for a fast express, holding incoming trains at stop signals while others leave through the busy station throats. When I first heard about this my thoughts were although it is very clever would it be any fun. The answer is yes, because the human interaction element is still 100%. On a typical operating session there are four to six operators each controlling a yard or station. For example at the London Station, every train that comes in needs to be turned around. This involves pulling the coaches back with a shunter to release the locomotive, the locomotive then needs to be sent for service and turned. The parcel vans need to be shunted and sorted. New trains need to be made up from the coach sidings. This is a big operation and can keep one operator busy for ages. Once a train is ready to depart a switch is set that tells the computer that train is ready to go and it can have control over that line. The operator then gets busy with another train while the computer will take the train out to its destination. I had the pleasure of operating London Station, in fact there were two of us, and while we were immersed in the shunting there were trains coming in and out and moving all over the layout which gave the feeling of a busy railway which is just what David wanted. What amazed me was how smooth everything was, and I don’t just mean the locomotives I was controlling. I have seen trains running before with automated systems and they tended to stop erratically and accelerate to max speed very quickly. In this layout trains pulled out of stations gracefully and glided to a gentle stop. This was achieved in several ways, firstly every locomotive on the railway has been speed matched and recorded in the software. This means that when David sets the speed on any controller to 20mph the locomotive will do a scale 20mph; that is a great advantage of DCC. Different locomotives have top speeds set depending on what they are; slow for freight, medium or fast for express. The system knows all the distances and the speed performance of the engines so it can work out how to smoothly control the train. David has also replaced the standard OO coupling with US style Kadee couplings which are much more reliable, and look better. He has also correctly weighted everything to keep trains uniform and ensure they stay on the track. This created a problem in that a lot of the UK motive power commercial available are not good pullers; so David has re-motored most of his stock. Below is a class 47 diesel with an Athearn motor taken from a US diesel. The extra weight of the big fly wheels give the engine the traction and power that it needs. He has also improved the power pickup on his locomotives and lighted rolling stock. Because of the extra weight he has added to the engines he was able to remove the traction tires which improved the power pickup. All these improvements and modifications help to ensure the railway runs trouble-free. To help the operators understand what is going on with the layout around the room are large display panels which show the layout in diagram format They include point direction indicators, signal settings indicators and train locations. Each block section has an orange light whcih illuminates when there is a train in the section. The one below shows the hidden tracks. These panels show the visible main lines. Below is a video I took of a passenger train leaving London Kings Park Station for Manchester with a stop at Birmingham. Here is a much better video that was taken by David showing the Midland Pullman doing the same trip. The sounds in the station at the beginning are coming from the DCC sound decoder in the train. David is in the process of expanding the layout into the next room. The extension will included a large number of storage tracks with lots of trains parked up behind each other. When one is sent out onto the layout the computer will shuffle all the others forward. On the top of the large storage facility will be a new scenic section; David is planing on making this countryside and industries. You can read more about the McKinley Railway on David’s website here. He also has more videos on his You tube site which you can find here. My visit to the McKinley Layout was a fantastic experience and I look forward to seeing it develop as the extension is built. Next weekend I am off to the London 3D print show and will be looking at all the new technology with interest. I will be there on the Friday if anybody would like to meet up. In next week’s post I will tell you what I discover that might be of use to the Model Railroad and Railway world. A few months ago I produced a 3D model for some replacement eccentric rods for a MRC/Rowa 2-8-4 Berkshire steam locomotive. My Berkshire was missing one and although it ran well without it I wanted it to look right. You can read the post here. I have now had some of the eccentric rods printed and in this post I will share with you how they came out. I printed the new eccentric rods in Shapeways’ Frosted Ultra Detail material; I did this just before they announced their new Frosted Extreme Detail material. The new FXD would be ideal for these parts. Anyway they arrived and once cleaned up looked very good as you can see in the image below. The bottom one is an original from the other side. In the image below you can see the two C shaped fixings which the eccentric rod clips into. One is on the 3rd driving wheel and the other is under the bell crank. The new rod clipped into the fixings fairly easily. I found it worked best if you fit to the bell crank end first, then the 3rd driver. As the pin on the 3D printed rod is very small there is the risk of breaking it off so I will be supplying them in a pack of four just in case. The new rods moved freely and showed no signs of binding. Next came a running test and the loco ran as good as ever but there was one tiny issue. And when I say tiny I mean 0.34mm. If you have a closer look at an original eccentric rod in the image below you can see the tiny pegs that clip into the C fixings. They both appear to eccentric to the center of each end but in fact the left hand end is closer to the center, 0.34mm closer. Now for such a small dimension you wouldn’t think it would make such a big difference. Have a look at the video below that shows the locomotive running with the original eccentric rod fitted and see how much the bell crank rocks back and forth, or gives the impression that’s what it’s doing. Then look at this video showing the locomotive with the 3D printed rod fitted. Although the rod runs well the slight extra length corrects the offset the eccentric rod is designed to make and the bell crank is hardly moving. Also it creates the visual effect that the end of the eccentric rod is closer to the center of the 3rd wheel, which would cancel out the movement. Although this is only a cosmetic problem I would like to get it right and, happily’ this is an easy thing to fix. I’ve moved the peg into the correct place in the 3D model and when I get a reprint done it will hopefully be all sorted. I think for the next set I’ll try these in the new FXD as well. So for now the Berkshire is back on the shelf. For next week’s post I have something a bit different to share with you; on the weekend I was invited to a running session at the McKinley Railway here in the UK which I greatly enjoyed as it is more than just a model railway. Next week I will explain what it’s all about and share some photos and videos with you. This week’s post will be a short one as it is a Bank Holiday here in the UK and I am having a day off. However I would like to let you know that my new N Scale Etched Chain Link Fencing system is now fully available and you can order it from my shop by going through the drop down menu or by clicking on this link. To read more about this new chain link fence system please see my post from a few weeks ago which you can find here. In next week’s post I will be getting back to normal and I will have some new 3D printed products to share with you.